Effective interest rate, or EIR, is the interest that actually accumulates on a balance over multiple periods of time. In other words, since annual interest rates are charged periodically, the balance of a loan will accrue interest at a faster rate than if the annual interest rate had been charged just once when the loan becomes due in full. To illustrate further, a $1000 loan with an annual APR of 12 percent will cost $120 to borrow. If that 12 percent is evenly charged periodically once a month over a year, one percent will be the monthly periodic interest rate. Moreover, with this periodic rate being charged monthly, the total interest on the loan will be $126.83 and not $120. The calculation for the effective interest rate looks complicated but is actually quite simple. Moreover, according to William R. Tucker of the United Nations Capital Development Fund (UNDF), EIR is calculated using the following formula. EIR= (1+Periodic rate) to the exponent of the number of periods – 1. Essentially all this means is for each period charge the periodic interest rate on the balance plus the prior periods interest. Using the above example to illustrate EIR = (1+1%)¹²-1 =12.68 percent. In this case 1+1percent is 1.01 percent. That number is multiplied by itself 12 times then 1 is subtracted. i.e. 1.01 x 1.01 = 1.021 x 1.01 =1.0303 and so on until the last of each calculation except the first has been multiplied by 1.01 eleven times. The resulting number is the total amount of interest that can be applied to the beginning balance to get the same result as when the original balance is charged the periodic rate twelve times. Another way to calculate effective interest rate is to use an online interest calculator such as the one at Money Chimp. The result of using that calculator yields the effective interest in the form of the original balance plus total interest for a 'future value'. The original amount of the loan must be subtracted in order to find the EIR. For example, Effective interest=$1,126.83 - $1,000 = $126.83. 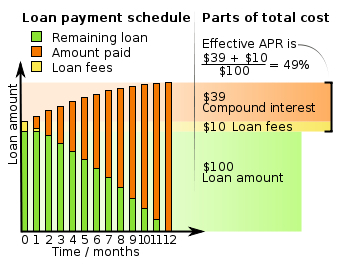 To convert the effective interest into the effective interest rate, it must be divided by the original loan i.e. $126.83 divided by $1,000 = 1.2683 percent. In summary effective interest rate is the amount that is really charged on a balance when that balance is charged the annual percentage rate in installments. The interest charged in those installments is known as the periodic rate and is compounded or charges interest on a balance that has been charged interest. After the total amount of periodic interest rates have been charged, a new balance with interest is determined but this new balance is higher than had the APR only been charged once.